Getting dinner on the table can feel like a race. You’re juggling getting home from work, trying to protect bed times, helping with homework, and, maybe, getting kids to and from activities. All these moving pieces can feel overwhelming. I have some standby sides I rely on that are simple to make AND they taste great. They make getting dinner on the table a little easier. I love to cook. But my motto for weeknight meals (and most weekend meals) is — Keep It Simple! A little meal prep can also help make getting dinner on the table easier. I really enjoyed Jessica’s guest post on meal prep! Click here to read the post if you missed it. It got me thinking about the meal prep I do. (I hardboiled a bunch of eggs right after reading Jessica’s post!). My meal prep has looked different over the years and it looks different each week. I go through phases where I’ll make a big fruit salad on the weekend, hard boil a bunch of eggs, roast a bunch of veggies, and make a big batch of rice or farro or quinoa. And, I go through phases where I don’t do any meal prep. A few items I meal prep on a regular basis these days are mustard vinaigrette and homemade taco seasoning. Keeping these around makes getting dinner ready easier. Trader Joe’s typically has bags of shredded brussels sprouts. All you have to do is add some olive oil to a saute pan, turn the heat to medium and empty the bag of brussels sprouts into the pan. Add some salt and pepper and sauteé for about 5 minutes or until they’re bright green. You can watch our video on how to cook them here. 2. 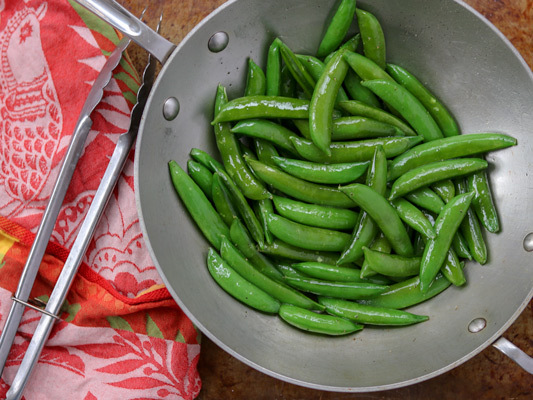 Green beans (fresh or frozen) with butter and Jane’s Krazy Mixed Up Salt. This dish takes me right back to my childhood and being at my grandparent’s house. My grandmother was an incredible cook and this was one of the veggie sides she served with dinners. Fill a medium saucepan half full with water. Add enough salt to make the water taste salty (about 1 tablespoon) and bring the water to a boil. Add the green beans, place a lid on the pan and cook for 5-7 minutes. Turn off the heat, remove the beans from the water using tongs (or carefully empty the contents of the pan into a strainer over the sink). Toss with butter and Jane’s Krazy Mixed Up Salt. Another one from my grandmother. She used to serve this in the summer with cucumbers fresh from her garden. To this day, the combination is one of my favorites. It’s also great on a sandwich with a few slices of goat gouda, a little Dijon mustard and some lettuce. Peel and slice a cucumber. 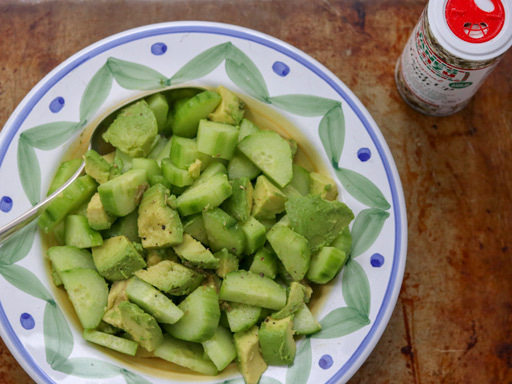 Cut up an avocado and toss with mustard vinaigrette OR season with Jane’s Krazy Mixed Up Salt. Don’t let the term braised turn you away! This is actually very easy to make. Rinse the asparagus and snap off the ends (great job for a child). Place a large sauté pan over medium high heat. Add 1 tablespoon of olive oil. Add the asparagus spears, season with salt and pepper and sauteé for about 5 minutes or until a few of them begin to brown. Then turn the heat down to medium low and cook for about 15 more minutes or until the spears have begun to soften a bit. Remove from the pan and serve. Anna roasts asparagus which works well, too – here’s her post: Easy, Convenient, Go-To Fruit and Vegetable Sides. The benefit to roasting it is that you can make everything in the oven and even try to fit your entire meal on one sheet pan. If you’re roasting something like chicken thighs and little new potatoes, you can add the asparagus to the sheet pan at the halfway mark to prevent it from getting overcooked. It’s one of my favorites. And it’s one of those foods my children don’t like (at least not yet). It’s easy to get stuck in the rut of cooking what we know our children will eat. It occurred to me when I was writing this post that I haven’t made roasted cauliflower in awhile. So, guess what I’m going to cook soon!? Keep offering foods even if your children refuse to try them. They’re likely to try it. If you stop offering a certain food, there’s no opportunity to try it. Preheat oven to 425 F. Cut the cauliflower into florets. (Or you can follow the same steps for roasting and use Trader Joe’s frozen cauliflower florets pictured here). Toss them with olive oil, salt and pepper. 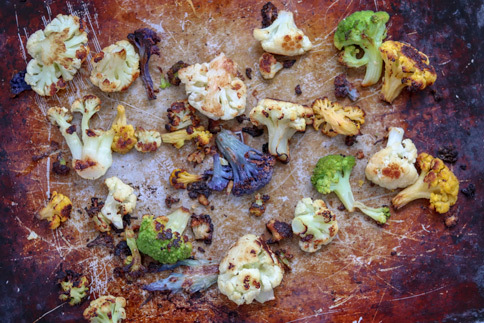 Place on a ½ sheet pan like this one here and roast in the oven for about 20 minutes or until the cauliflower has begun to brown. Remove from the oven and serve. Strip the leaves from the stems (a great job for kids!). Cut or tear the leaves into about 2 inch pieces. Rinse the leaves under cold water. Heat a large sauté pan over medium high heat. Add 1 tablespoon of olive oil. 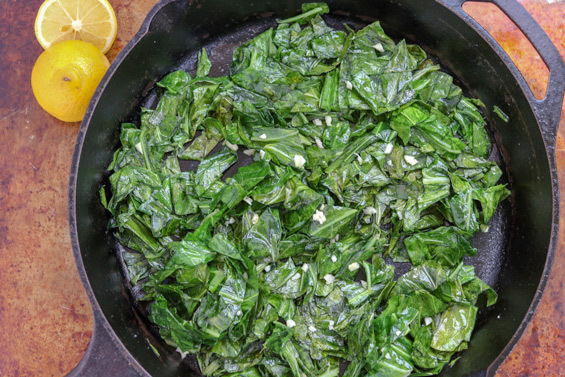 Then add the chard (or other leafy green leaves) to the pan. Season with salt and pepper, turn the heat down to medium low and cook for 5-10 minutes stirring occasionally. Different types of greens will take different amounts of time to cook. The leaves will look bright green and slightly wilted when cooked. When they’re done, toss with 1 tablespoon of olive oil, a chopped clove of garlic, and about 1 tablespoon of lemon juice. The recipe also calls for a pinch of red pepper flakes which I don’t use. It doesn’t get much easier than this. 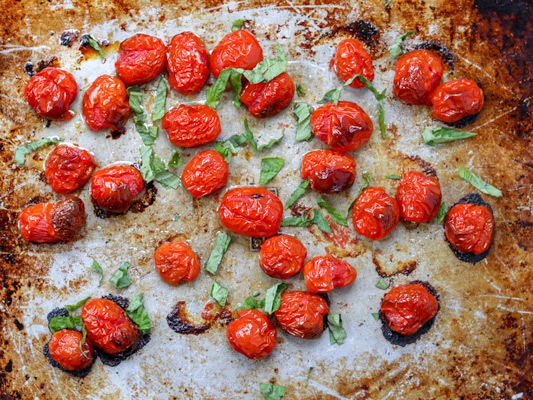 Preheat your oven to 425 F. Toss the rinsed cherry or grape tomatoes with olive oil, salt and pepper and place on a ½ sheet pan. If you like you can add a few whole cloves of garlic on the pan with them. Place them in the oven and roast for about 15 minutes or until they have begun to burst. Once they come out of the oven add 1 tablespoon of pesto and stir. Or add chopped basil instead of pesto. Even though this one is obvious, I included it because it’s so easy and we are a houseful of broccoli lovers, so it’s something I make a lot. Bring a pot of salted water to a boil. Cut the broccoli into florets (or buy pre cut florets) and add to the boiling water. Place a lid on the pan! If you forgot this step, your whole house will smell like broccoli! Cook for about 5 minutes (a few minutes longer if you like broccoli cooked more tender). Carefully remove the broccoli from the water using a slotted spoon. Toss with a bit of butter and salt and pepper. This one truly takes less than 10 minutes, at most, to make. Cut each bunch of bok choy in half and then cut the end off. Separate the leaves and rinse under cold water. Heat about a teaspoon or 2 of olive oil in a large sauté pan over medium high heat. 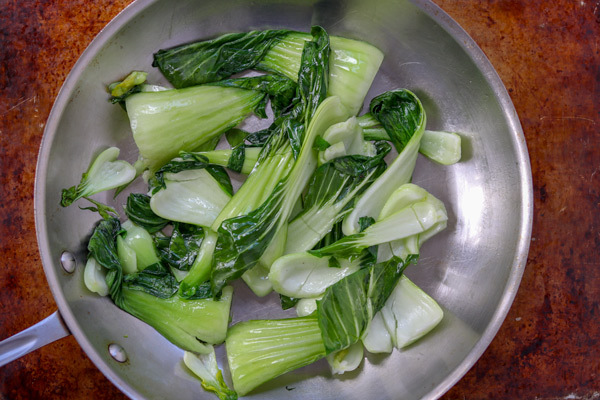 Add the baby bok choy leaves along with some salt and pepper and cook, stirring occasionally for about 5 minutes or until the leaves are bright green and have begun to wilt. Squeeze fresh lemon juice over them and serve. Or, you can drizzle them with a little soy sauce. These are super quick. They’re also good cold (add them to a salad or eat them on their own) or reheated — if there are leftovers. Rinse under cold water. Then remove the ends and strings from the sugar snap peas. Place a medium sauté pan over medium high heat. Add about 2 teaspoons of olive oil. Next, add the sugar snap peas and some salt and pepper. Sauté for 3-5 minutes or until they’re bright green. As we often remind everyone, meals don’t have to be complicated to be nourishing! What are your favorite quick and easy fruit and veggie sides? We’d love to hear from you!